Always been a fan of the mantids, though, admittedly, they are about the most callous hunters there are, eating their victims alive, one chunk of flesh at a time. And yet they are so elegant. and seemingly the most intelligent of insects. This one was at the bottom of the stairs, indoors. Not a good place for it. So, I decided to bring it up to our balcony garden. 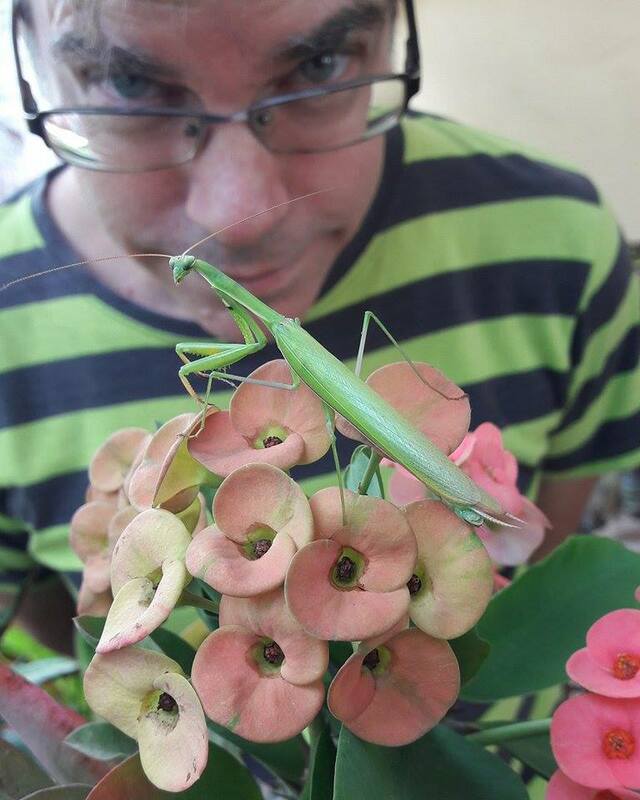 The mantis just had no problem with me lifting it up and placing it on the flowers for a photo. I wasn’t supposed to be in it. This isn’t posed. My gf clicked her camera before I had a chance to get out of the field of vision. I ended up putting him on a plant in the corner where I thought he’d be safe. Later, when we got some wind and rain, I decided to bring him inside. It is a dude. I looked it up. It’s wings are longer than its abdomen. Don’t worry, readers, I’ll be back with one of my customary rants quite soon. I have something good planned. But, I suppose it wouldn’t hurt to show once in a while that I’m a human, and with a fondness for small creatures. Posted in personalTagged flowers, green, insect, praying mantisBookmark the permalink.